A commonly overlooked reason for the difference in income levels among taxpayers is the life cycle issue. As we mature and gain work experience, our incomes tend to rise; income typically peaks when we near retirement. Viewing annual Internal Revenue Service data only provides a snapshot of a taxpayer’s situation rather than a fuller picture of their well-being—the life cycle of income is important context for income inequality discussions. The chart below illustrates Internal Revenue Service (IRS) data from tax returns filed for the 2016 tax year. Taxpayers nearest to retirement, ages 55 under 65, reported average adjusted gross income (AGI) of $99,836. 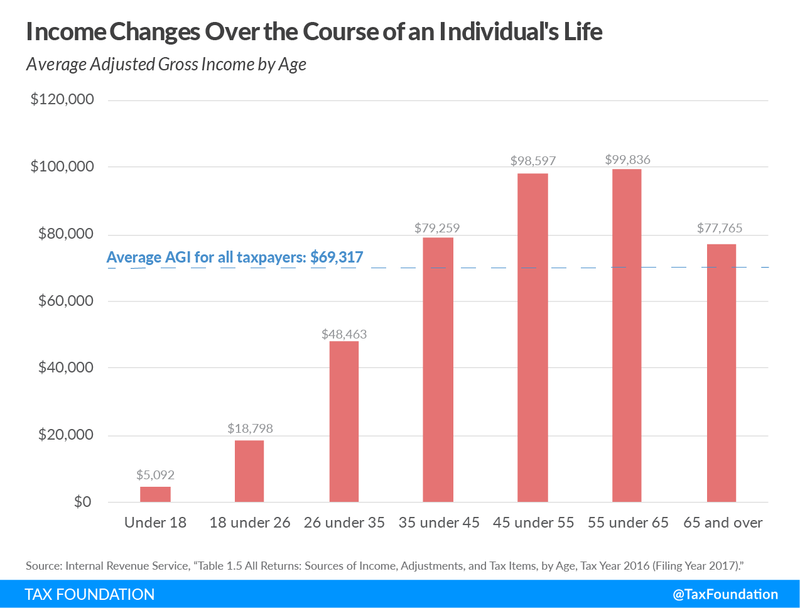 Compared to the average AGI for all taxpayers of $69,317 and the average of $18,798 of the 18 under 26 age group, we can see that incomes tend to rise as taxpayers grow older and more experienced. Income tends to exhibit an inverted-U-shape pattern, rising with age and then dropping slightly as taxpayers enter retirement. However, even taxpayers age 65 and over make above average incomes. This tells us that as the baby boomer generation continues to move into peak earning years, there will be more higher-earning taxpayers than younger, lower-earning taxpayers—contributing to the appearance of a rise in inequality. Conversely, while lower income can sometimes be a sign of a lack of opportunity, in some instances, this is not the case. Previous Tax Foundation research shows that college students in particular comprise a large number of low-income taxpayers and that “America’s lowest incomes are actually found in college towns.” Viewing just one year of income tax data without digging any deeper misses this context. The income of an average taxpayer rises dramatically as he or she ages and gains education and experience. A snapshot of income data in one year cannot tell the life cycle story of income. This is just one of the reasons why IRS data is not the best way to measure income inequality.